Milk and Cookies with Santa! Presents for the Kids!! 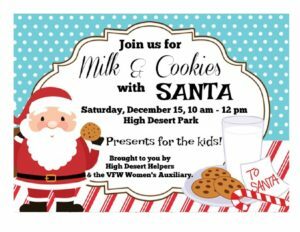 December 15th 10am-12pm - High Desert Helpers, Inc.High Desert Helpers, Inc. High Desert Helpers, Inc.Milk and Cookies with Santa! Presents for the Kids!! December 15th 10am-12pm - High Desert Helpers, Inc.
« Soup Supper- Come on out and Enjoy!! You will love it! Brought to you by High Desert Helpers and the VFW Women’s Auxiliary.